Glazed thin brick can add both texture and color to any area in the home, both dry and wet applications. Fireclay Tile’s version is available in nine smashing colors from deepest black to a gentle green to a couple variations on white. Custom colors are also available. The bricks come with natural variations in colors that add a depth to any surface they are applied to. The bricks can add a rustic, yet finished look to many areas in baths, kitchens, entryways or other residential areas. With high levels (30-100 %) of recycled materials and VOC-free glazes, Fireclay Glazed Thin Brick can count toward LEED credits. With their thin profile, you’ll get the same effect as traditional glazed brickwork but with substantially lower shipping costs. 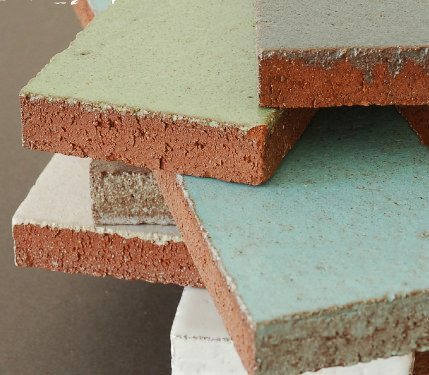 The brick pieces are slightly larger than some commercial thin brick and with fewer pieces per square foot, time and labor for installation is reduced. For areas where recapturing or holding a little extra heat for passive solar or applications in stove or fireplace surrounds, thin brick can add subtle radiant warmth that is more than just good looks.